A Star Wars ship combat game on the scale of Armada probably appeals more to me than X-Wing. The more salient concern, however, is all the X-Wings on our gaming shelf, unmarked by combat. Rarely ever flown at all, in fact. Turns out the downside of a collectible or a miniatures game is less the expense, and more the time required to play it over and again with all the additions and expansions. With so many incredible games being released all the time, it’s harder and harder to get replay value out of the games we already own. Of course, this is a problem entirely of our own making. And it’s a lack of restraint that is the main ingredient of that problem. There are just so many good games out there. We haven’t even gotten around to buying Imperial Assault yet, and our Risk: Legacy campaign is currently experiencing a ceasefire. Not a truce, or even negotiations. It’s just looking like we might be embedded for a while longer than first anticipated. Bloody great game, though. Manoeuvring slowly back around to Armada, though, it is certainly a game I want to play. Space combat in the Star Wars cinematic universe was always very focused on the smaller classes of ships. It was always swarms of TIEs Vs X-Wings, Y-Wings and whatever else the rebels found in their Alphabet Soup that morning. It made for fast-paced, exciting action. But the most impressive ships were always the Imperial Capital ships. It’s in the opening shot of the first film, our literal very first glimpse at Star Wars was the Tantive IV being fired upon, and then the seemingly never-ending mass of the gigantic Imperial Capital Ship crawls past the camera. Completely engulfing the rebel ship, and permanently burning its image into the mind of every kid who has ever sat in front of the film. The TIEs and X-Wings might have had all the best combat, but they will never match the impression the Star Destroyers made. A game being fought on that scale demands a greater level of forward thinking and strategy than X-Wing does, and that hits a sweet spot for me. Catching your opponent in the inescapable grip of a carefully thought out plan that has taken several turns to come together is as satisfying as a record-breaking Kessel run. The turns leading up to this success, constantly re-evaluating your plan, wondering if you opponent will catch on, holding your breath while their hand hovers over a miniature or pawn, hoping they won’t see what you don’t want them to see. Desperately trying to see through their poker-face and figure out what their plan is. Hoping you haven’t missed some small, but essential detail. Getting more and more nervous and trying to hide it. Trying not to stare at that part of the board, that one small element that your victory will hinge on. Those are the games that I love. This is what draws me in, makes me truly live and breathe a world that previously only existed in cardboard, plastic, dice and rules. I have yet to see the game in action, but from what I have gathered online, Armada delivers this experience, and does so in a world we have all wanted to be a part of since childhood. 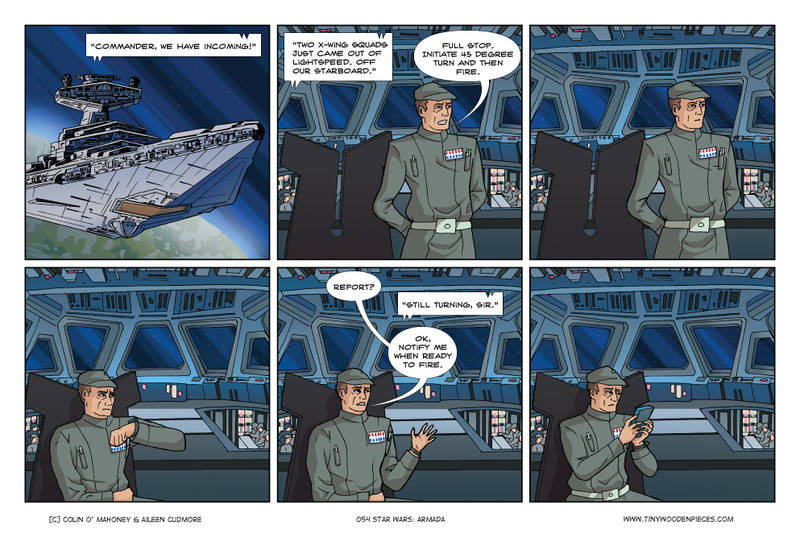 I don’t think this is going to be the last Star Wars comic you see from TWP this year. Probably not even this month. People who are not fans should be cautious. They should also get that looked at. I mean, it could be infectious, and then where would we be? For about 6 months now there has been, under my bed, a couple of boxes worth of the Star Wars PocketModel TCG that I bought to play with my son. All set to be brought out on a rainy day, perhaps when his older sister was away at a birthday party. One day, it will come out. One day…..
Why not try and lure the older sister into trying it out with you? Oh I will 😉 I actually thought initially it was a 2-player game, and therefore it was primarily going to be his treat. But apparently it will support more players, so she will definitely get a go. I’ve avoided X-Wings because I can’t afford to get pulled into another collectible, but Armada looks amazing to me. I can’t wait to play it!